I've gobbled up dozens of literary biographies since college without ever encountering anything that seemed like a great book. The genre seems to attract writers who, despite their intelligence and doggedness and appreciation for the subject, are usually just too ordinary to have much insight into extraordinary talent. (Richard Holmes is a semi-exception.) But I keep reading them, and lately I’ve come to appreciate them more as anthologies: selections of illuminating excerpts by great authors and the people who knew them, with passages of relevant context. Like a good anthology, I think a real biography should be long. Slimmer, supposedly "readable" biographies seem to be coming into fashion, but there is nothing less interesting than the bare details of a writer’s life; the best stuff will always be on paper, and if someone is worth writing about at all, she will have hundreds of interesting pages tucked away – letters, journals, stray articles, juvenilia, bits of table talk preserved by other people. So why not overstuff? The best literary biography – which, full disclosure, I have never finished – is by general consensus The Life of Johnson because Boswell put in everything he could find (and perhaps went a little overboard). Note: I do not mean overstuffed with the sort of minutiae that fills bad doorstop biographies, like the dates on which an author visited various people and what they ate and wore; I mean overstuffed with a writer’s words and conversation. Jonathan Bate’s 600-page biography of Clare is, luckily, stuffed in the right way. 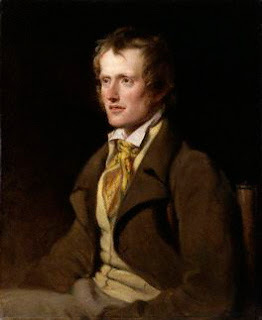 Even when there is little solid information about a period of Clare's life, like his childhood, Bate quotes his poems and journal entries to create the necessary background (Clare loved cataloging village rituals and lore, and wrote some of his loveliest poems about his childhood games and wanderings). And when, in his 20s, Clare finally sets out to collect subscribers to publish his first little volume of poems, the book begins to soar, because Bate now has a wealth of writing to work with. We get more of Clare's verse, and selections from his wonderful letters and prose pieces, written in the headlong, unpunctuated, but beautifully precise manner he used throughout his life. I became fond of scribbling from down right pleasure in giving vent to my feelings and long and pleasing and painful were my struggles to acquire a sufficient knowledge of the written english before I could put down my ideas on paper even so as to understand myself but I mastered it in time sufficiently to be understood by others and then I became an author by accident and felt astonished when the critics became my friends that they should have noticed me at all — and no less supprised at the mistakes they uttered — that one should imagine I had read the old poets when such were as far from my access as earth from heaven and that others should imagine I had coined words which were as common around me as the grass under my feet — and all these were burning encouragements that made me work on — as to profits — the greatest profits most congenial to my feelings were the friends it brought me and the names that it rendered familiar to my fireside — scraps of whose melodys I had heard and read in my corner — but had I only imagined for a moment that I should hold communion with such hereafter that would have then been to me ‘as music in mourning’ — but I wrote because it pleased me in sorrow—and when I am happy it makes me more happy and so I go on. Forgive me for quoting at such length, but isn’t it difficult not to love this man? His voice comes across so clearly in his writing, so free of affectation and full of warmth, that one feels an immense affection for him that it's hard to feel for, say, Shelley. And throughout Clare’s life, people that met him felt the same way; even if they were patronizing or snobbish, they liked him and wanted to help him. A real intellectual collaboration developed between him and his early publishers, and Bate shows how important this literary society was for his artistic growth. And unlike the other great Romantics, Clare was greeted kindly by reviewers throughout his career, even if it was sometimes more for his up-from-nothing life story than his work. After his first collection of poetry was published, Clare was the talk of the town for a few years, and Bate quotes extensively from his incisive pen portraits of the great figures of the age — Hazlitt, Lamb, de Quincey — whom he met during a handful of stays in London. Then comes the awful decline: money troubles, diminished sales, frequent drunkenness and womanizing, feelings of estrangement from his family, and growing mental instability, almost always dotted, however, with poems and prose sketches of extraordinary beauty and increasing mastery. Doctors often say that they can predict from an early age which of a group of children will have mental health problems later in life. It is usually the one who feels different: the misfit, the loner. Clare’s autobiographical writings reveal that he fell into this category. The hostility aroused by such a character in a small close-knit community led to village gossip that marked him out as too clever by half and likely to prove a lunatic. The sense of being a marked man made him feel more of an outsider and an oddity: the village prophecy that he would one day go mad contributed to its own fulfillment. Isn’t there a whiff of the commonplace around this passage? Does Bate really think that such explanations — that he felt different from other people! — bring us any closer to understanding what happened to Clare? And this atmosphere — of reasonable intelligence coupled with a lack of imagination, of genuine love for the subject mixed with an inability to make any truly inspired acts of identification — hangs over even the best biographies I’ve read. These books are good at compiling and scene-sketching, but that deeper stab into the secret of an artist’s gift never seems to come; instead, we keep butting up against the biographer’s mundane attempts to "explain" the artist's personality. Eventually, though, Bate has the good sense to give up on explanations. He simply quotes from the writing Clare did over his two decades in asylums: his poetry, his increasingly disordered journals, including some bizarre letters written in cipher, as well as visitors’ accounts of his behavior. Some of it is fascinating, since Clare was still capable of long periods of lucidity and inspiration, but as he becomes increasingly estranged from the things that once gave him joy – poetry, nature, his home, his family – it is mainly just heartbreaking. Even with its desolate conclusion, though, Clare's life ends up feeling heroic instead of depressing. Few poets have done more with the talent given to them, and in the face of such obstacles. Robert Graves, who Bate quotes near the end of the book, comes closest to describing my feelings about Clare's work: "I find myself repeating whole poems of [his]," he wrote, "without having made a conscious effort to memorize them. And though it was taken as a symptom of madness that he one day confided in a visitor: ‘I know Gray — I know him well," I shall risk saying here, with equal affection: ‘I know Clare; I know him well.’" When you read his work, he always seems to be walking next to you, pointing out hundreds of things that you'd never noticed before or realized were beautiful; and while other poets shout and sing, conscious of their audience, and some seem to be whispering entirely to themselves, Clare is one of the rare ones who speaks to you in his ordinary voice, naturally, as one friend to another. The best volume of his I have found is the Oxford Major Works, which contains poems along with prose sketches and a few letters. If you end up loving his work as much as I do, you’ll want to read Bate’s book, which does the things that a biography can manage to do, and does them well enough for me to be grateful.